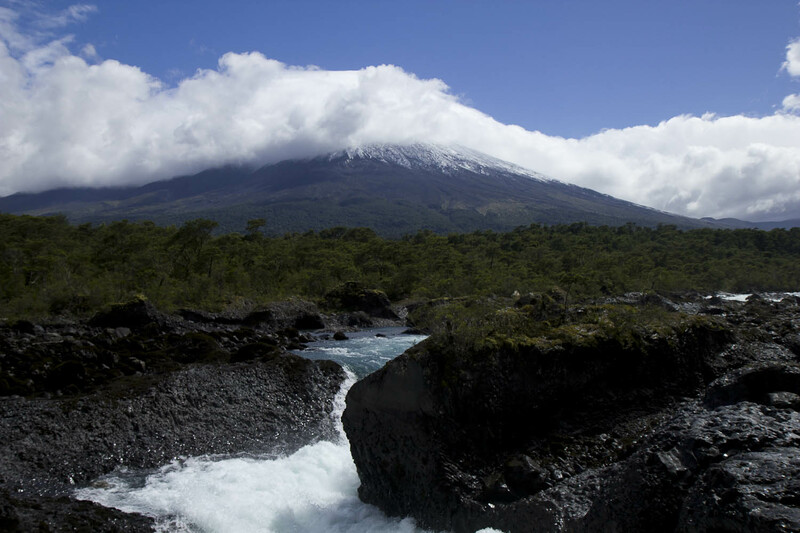 We finally made it to Puerto Montt, beyond exhausted. We were pretty disheveled at this point. Hitchhiking for 6 weeks up the Carretera Austral will do that to you. The ferry arrived at 6 am and we made our way through a real city! 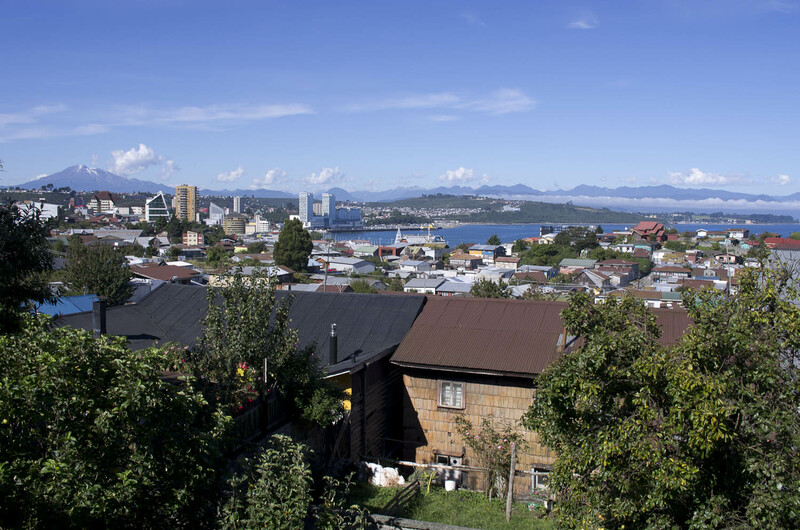 Puerto Montt has just about 200,000 people, so not such a big city by real world standards but for us, it was the largest city we had seen in a very long time. Huge, real double-decker (!) buses rushed passed us. After seeing just minibuses for the past month, these buses looked heavenly. 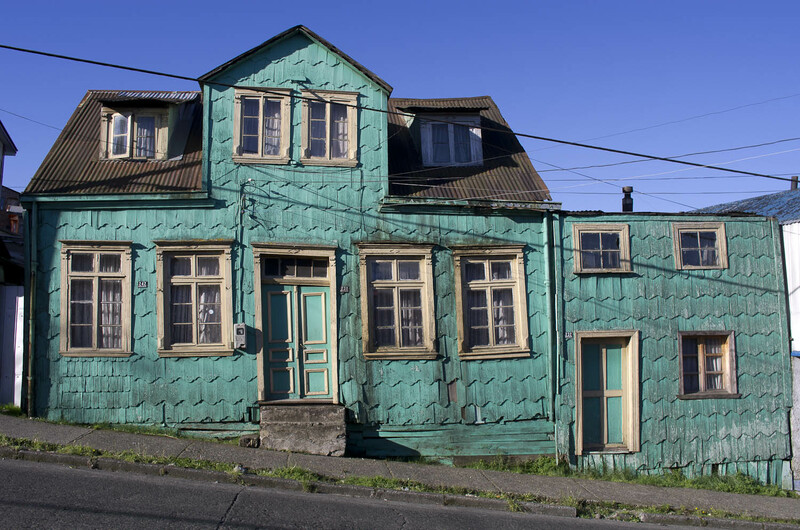 Puerto Montt boasts some nice views from its scenic port but other than the vistas, the city is not much to look at. It’s basically an industrial port city. Yet despite this, we stayed here for one week. We needed time to recover and rest. We did laundry, had lots of showers, slept in real beds, ate sushi & took money out of cash machines! We were back to city life. It felt great. 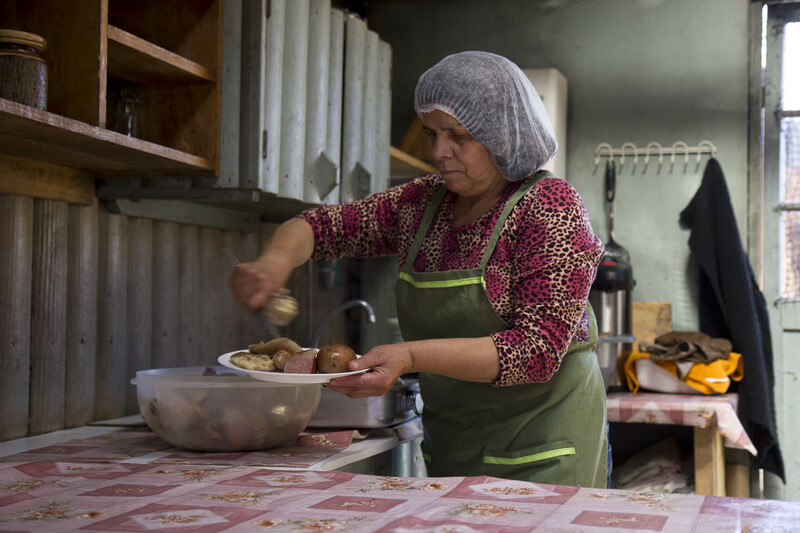 In Puerto Varas, as well as Puerto Montt, you can see the German influence that the early immigrants left (Germans were encouraged by the Chilean government to immigrate here in 1848, you can read more about it here) and so it was here we got to try kuchen. 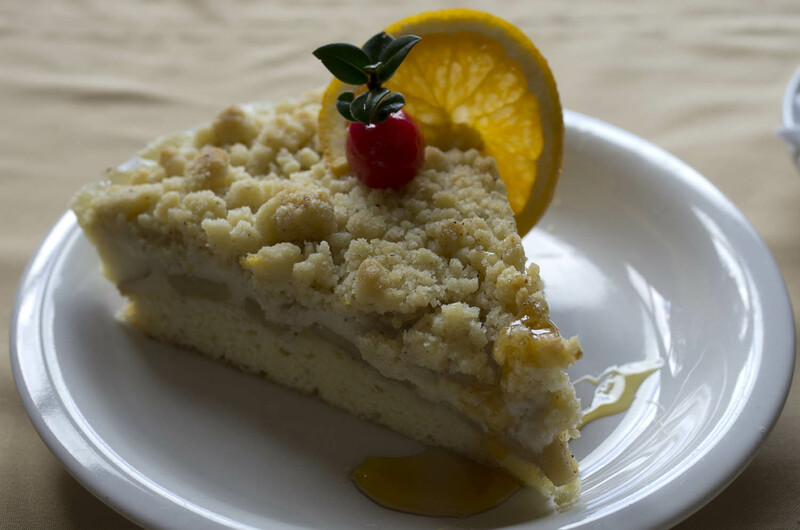 Kuchen is the German word for cake, and here in Chile it usually is a cake base with a custard topping and perhaps crumbs on top like the below photo, in this perfect apple kuchen. 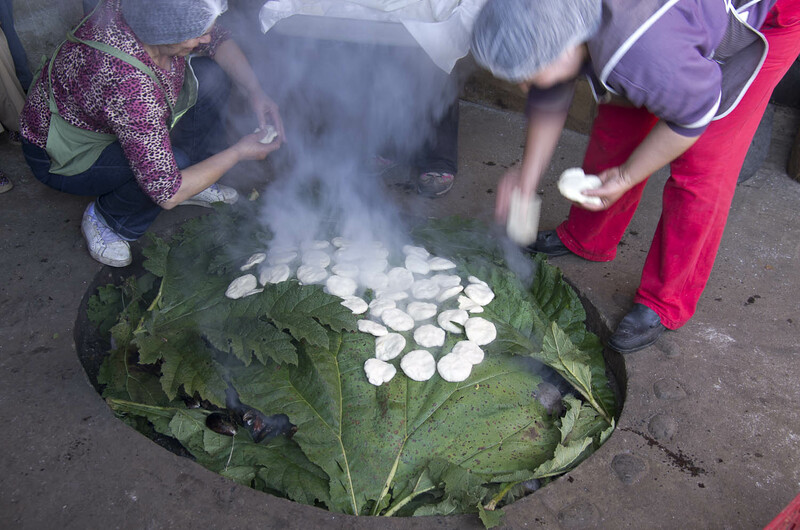 I know it seems unlikely that this is now considered a Chilean food but you can find it literally everywhere. 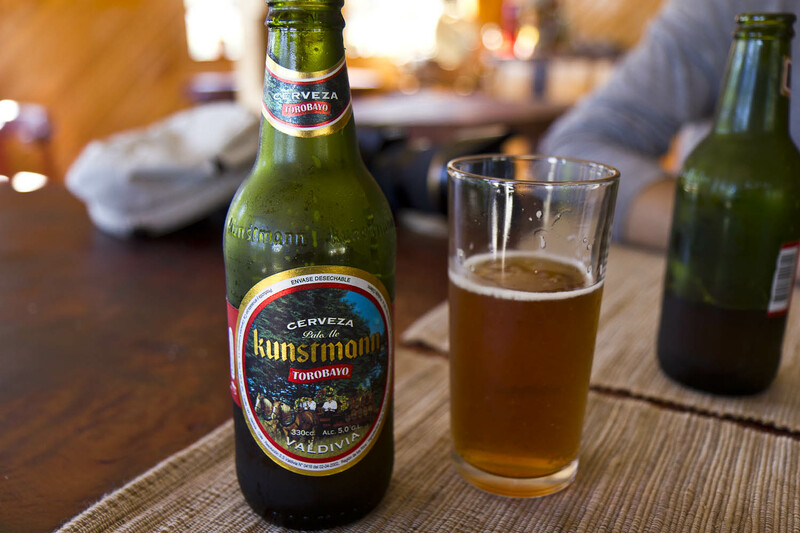 The German influence left its food legacy in the form of cake ( & good beer). 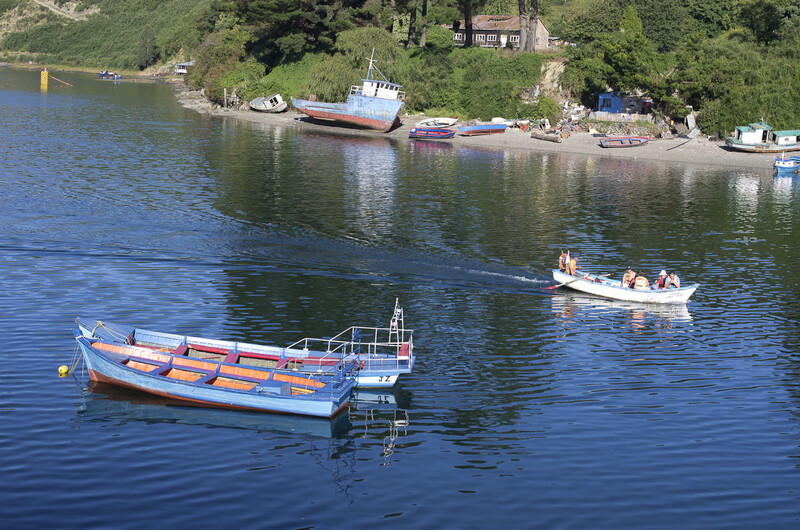 In Puerto Montt you can find very fresh fish at the market in Angelmo. 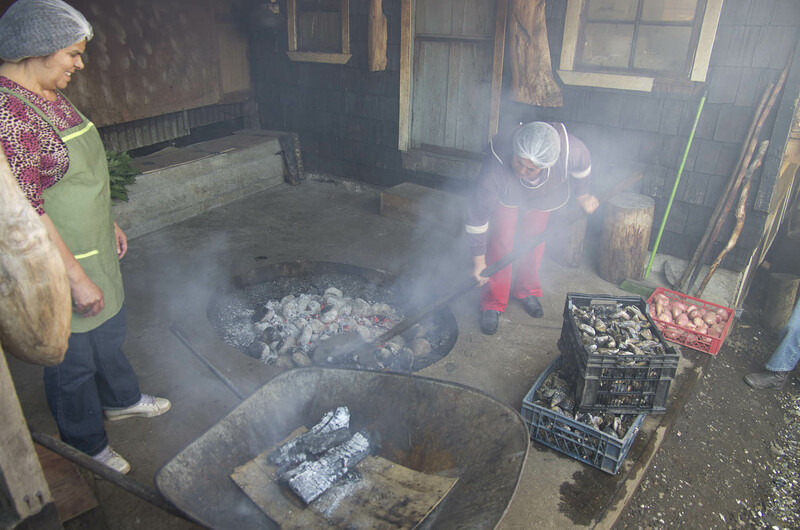 The fishing boats work directly out of Puerto Montt so eating the catch of the day is fairly easy. The fish is not fancy or fussed over much but its very fresh. There are also many farm fisheries here (see below). 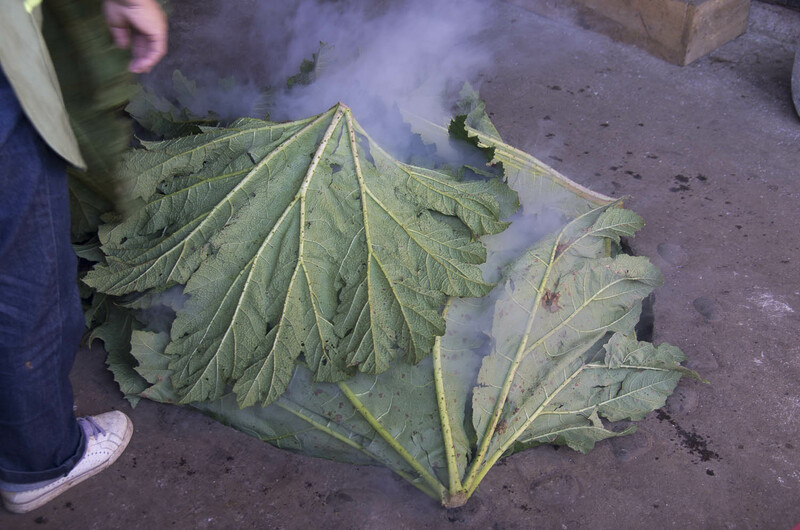 When you think of Chilean fish, many of you will automatically think of ‘Chilean sea bass‘, however, they never eat this fish in Chile (unless you are down in Patagonia catching it fresh, & there it is referred to by its real name). Chilean sea bass is actually a name that is used to market the Patagonian toothfish to North American restaurants. Most people in fine restaurants do not want to eat something called toothfish. So they coined the Chilean sea bass name. Sounds more elegant but it’s not even a bass! This fish is one of the most endangered in the world, so avoid it. You can read more about it here. 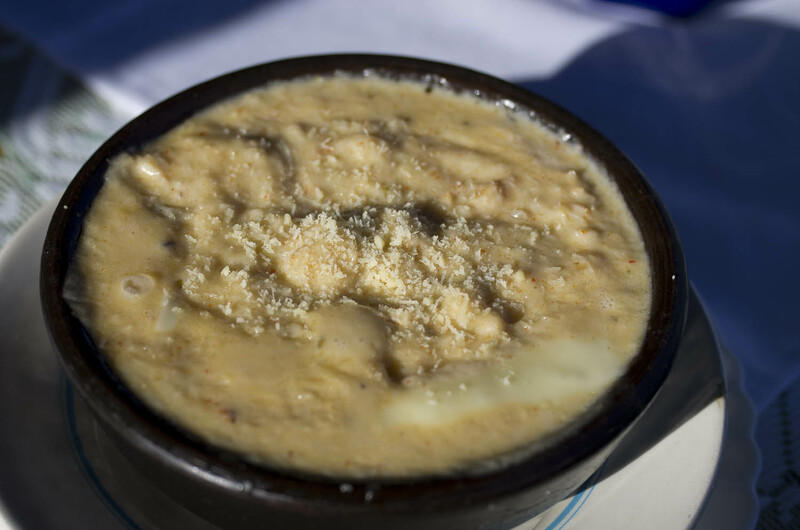 In Angelmo, I tried my first Chupe, which is a traditional dish served in an earthenware bowl, made with cream, cognac and lots of cheese and fish. I had the Chupe with crab. It was fresh and the flavor was good but very rich with the cream & cheese. 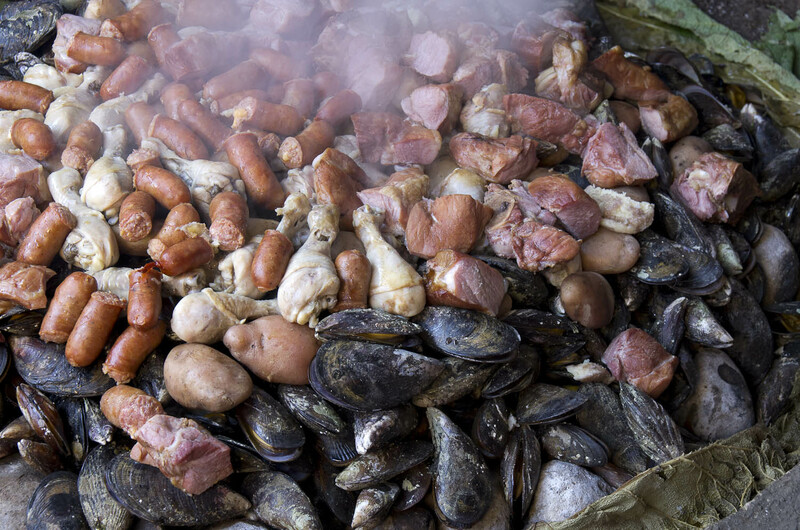 In Chile, they eat an assortment of seafood, thanks to that really long Pacific coastline. 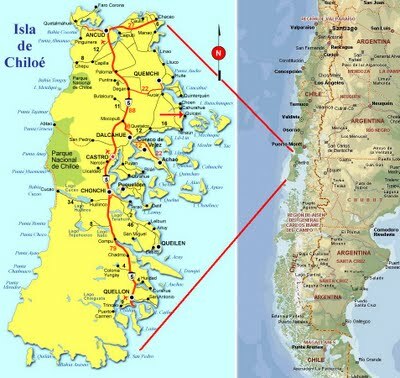 After resting in Puerto Montt for the week, we went over to the nearby island of Chiloe (see map at the right) for a taste of some of Chile’s best seafood. 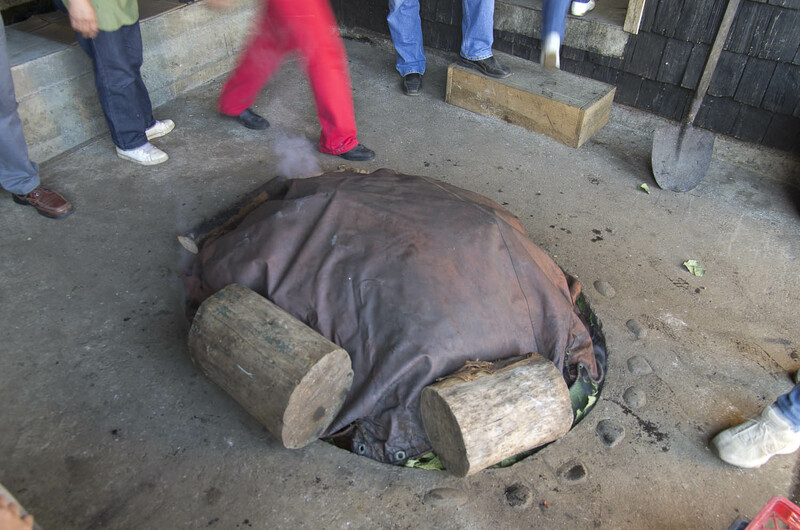 They are most famous for a dish called curanto en hoyo, which is basically a big stew, cooked with only steam on hot stones in a hole in the ground (en hoyo) The dish consists of cholgas (mussels), almejas (clams), pork, chicken, sausage and three kinds of potatoes. It may seem like a lot & it is but it’s so delicious! 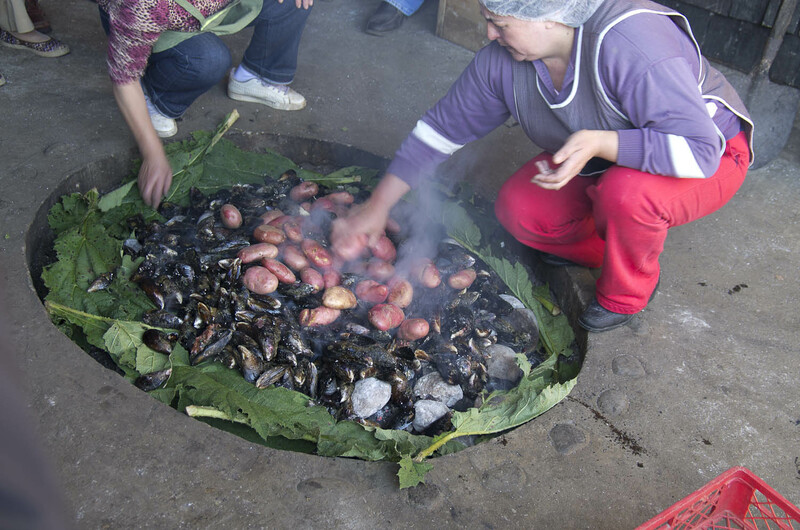 And let me tell you, I don’t like mussels but I tried these giant ones here and I absolutely loved them! They were so creamy and not at all fishy like mussels I’ve had in the past. 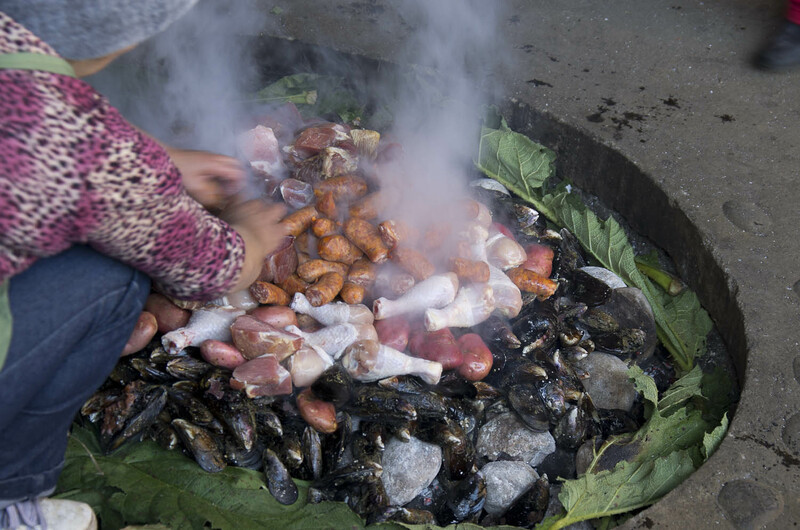 Castro is the capital of Chiloe, famous for its palafitos and its seafood, so we spared no time in tracking down one of its best restaurants, Mercadito. 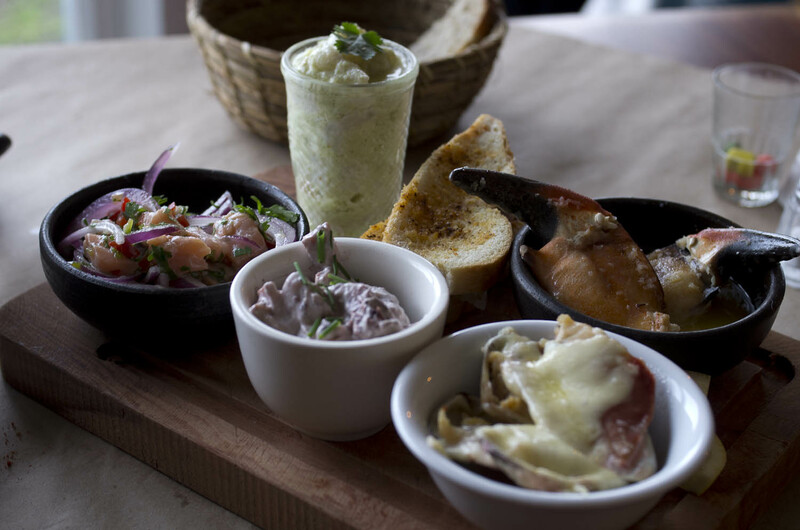 We started with a sampler consisting of salmon & merluza (which is hake; one of the most popular fish in Chile) ceviche. 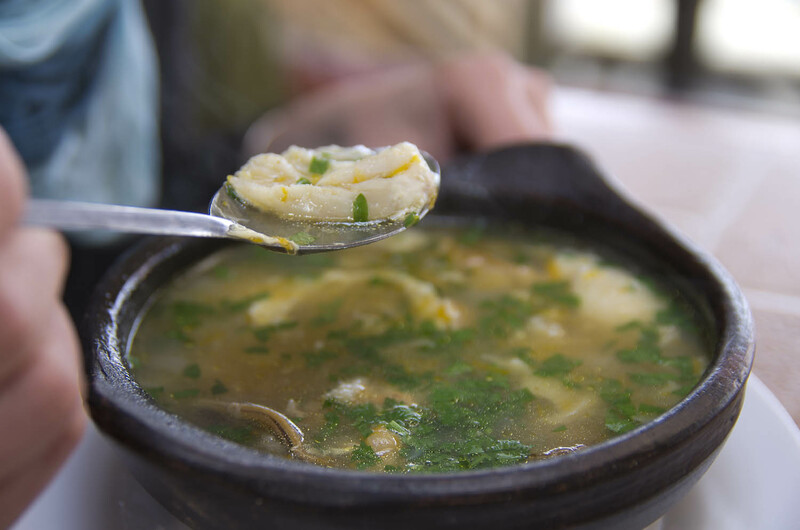 Chile isn’t particularly known for its ceviche (that’s more Peru’s territory) but this one was exceptional. The starter also had pulpo (octopus) and crab. My favorite were the machas (razor clam) parmesean. Everything was fresh and exceptional. Congrio (conger eel), is a fish that you can find all over Chile. It’s caught wildly, so you don’t have to worry about the farming issues. 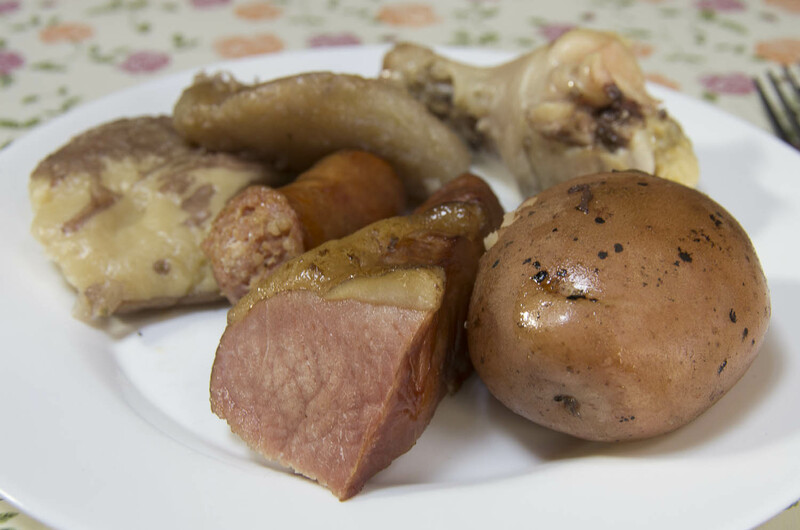 It’s mild and flavorful. Perhaps the best preparation I’ve had of it so far, has been in this version of paila marina (fish soup) made with congrio & choglas (mussels). Important side note: I ate the salmon ceviche with quite a bit of guilt and while I am not going to get into to it too much here, I feel the need to at least mention it. Most of Chile’s salmon is farmed (if not all). In fact, Chile is the second largest farmed salmon producer (after Norway). 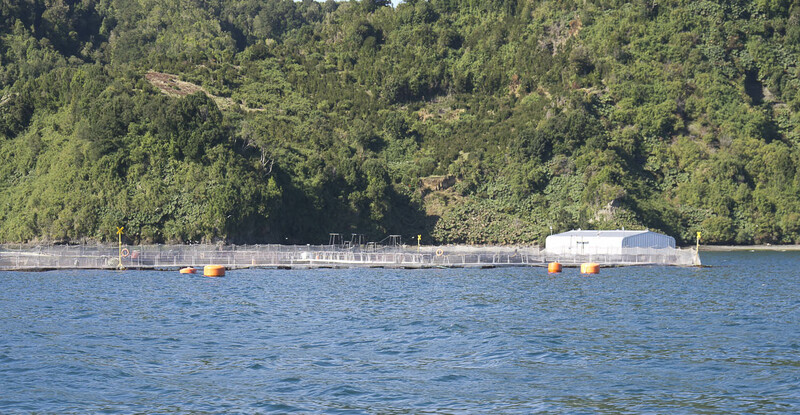 There is much controversy (rightly so) surrounding the fish farms in Chile. 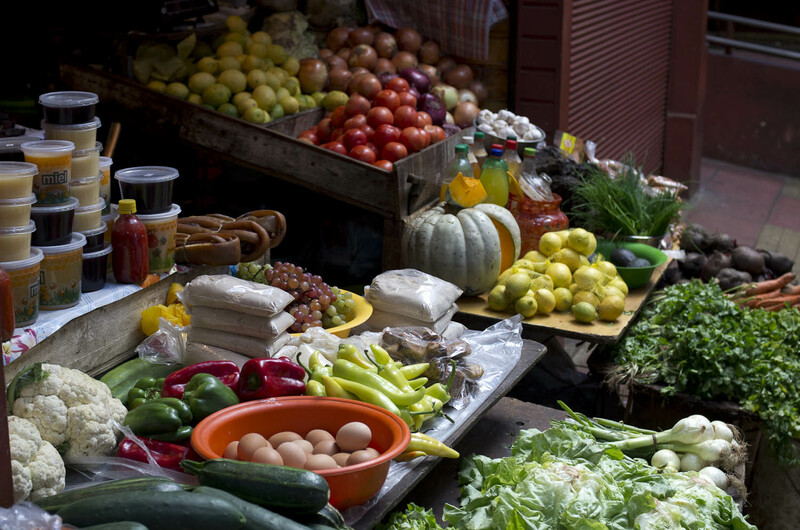 A great article can be read by clicking here, it’s part of an excerpt to a book and even though it’s long, it’s important to read if you care where your food comes from and what the food you consume might be doing to the planet. 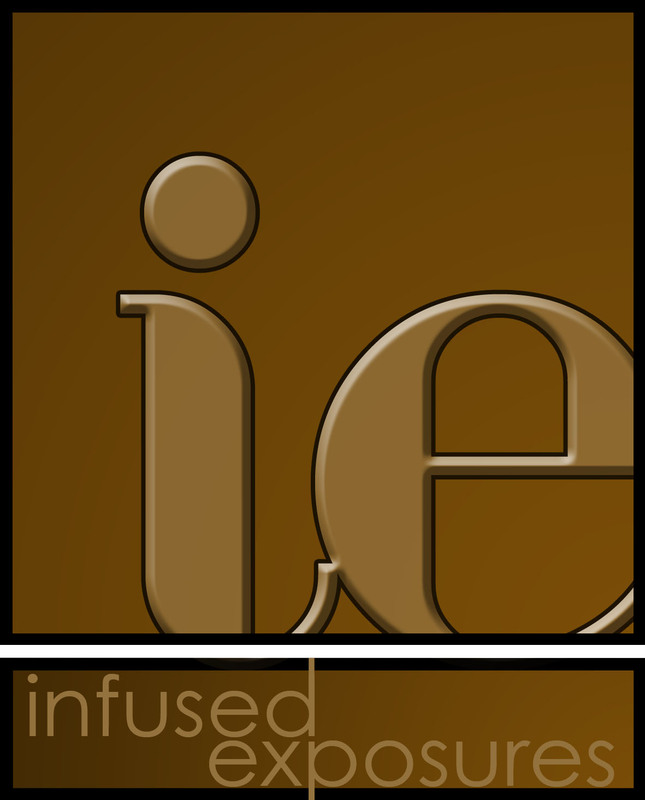 ← The last installment…it’s all about the journey, although arriving at the destination was a relief!